Learn about the temperament and personality of the Belgian Sheepdog. Discover what he's like to live with, his traits and characteristics and how he generally behaves. And look at lots of Belgian Sheepdog photos. The Belgian Sheepdog (also known as Groenendael) is a high-energy, highly versatile dog known for his loyalty and protectiveness. They develop very strong bonds with their owners. They thrive as members of highly active families, especially when given jobs to do. 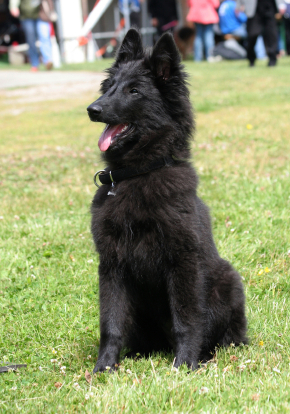 The Belgian Sheepdog is very quick to learn, highly trainable, very intelligent, and needs to be mentally stimulated! He also needs to be physically stimulated with lots of daily exercise! They enjoy obedience, schutzhund, agility, flyball, Frisbee, herding, sledding, and tracking. They also work as search and rescue dogs, guide dogs, and therapy dogs. If you don't give him enough exercise and purpose, the Belgian Sheepdog will run around your house causing chaos and destruction, while barking all the time. If he gets bored, he will probably chew the rockers off your rocking chair and destroy your couch. The Belgian Sheepdog loves to be with his family, but can be wary of strangers. They are alert and observant and make good watchdogs. They are naturally protective, and are even possessive. They might try to herd you and your kids. They do well with children. However, these are strong, energetic dogs, who might accidentally run into and knock over a child. They will also chase small animals. They do best with a fenced-in yard, and they love to spend time playing outdoors. But this doesn't mean you can banish him to the yard. Belgian Sheepdogs need to be with their families. They are sensitive, affectionate dogs, who with proper love and discipline are happy, responsive, playful companions with a great sense of humor. They can live anywhere, country or suburban, as long as they get to use up their energy. They just need an owner who is willing to invest the necessary time and effort in training, exercising, socialization and bonding! The Belgian Sheepdog is a very heavy shedder. He sheds an awful lot of hair! You'll find hair all over your home, stuck to everything! You'll probably even find it in the butter!